Score Big White BC Lodging Savings & Easy Big White Vacation Planning Advice! Use our Big White BC owner-direct lodging & consumer-direct ski vacation planning directory to quickly & easily organize your British Columbia Canada ski vacation. Save money & get more Big White BC value & hospitality. Choose from 135+ top-located, unique & personal Big White family ski homes & book Big White lodging with one of our friendly owners! View Big White BC Vacation Checklist! Free Fast & Fun! Book direct with Big White BC owners on our wholesale, Big White lodging & vacation planning site to avoid middle agent fees. Search our large selection of private Big White BC homes and condos using our fun & easy Big White lodging search tools! Planning your own Big White BC vacation & Big White lodging is fun, easy and fast! If you have a computer with an Internet connection, creating your own personal Big White ski vacation can be done in minutes! Follow the steps below to start planning your dream trip to Big White ski resort. Book top-located Big White mountain lodging direct with homeowners & save money by avoiding middle agent fees. Quick search 135+ Big White lodging options & view the exact BC rental home you will stay in before you book online, including detailed photos, descriptions, Big White maps, owner bios & more. 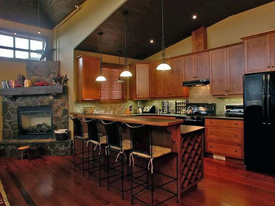 Enjoy the personal hospitality & benefits of renting a BC family ski home. Owners are locally knowledgeable, dedicated Big White BC customer service representative with no other guests during your dates except you! Find a rental using the search bar at the top of this page. Kelowna International Airport takes many local and international flights. Most Canadian and many US cities now connect to Kelowna. Big White BC is just a short and easy 45 minute drive from the airport. When booking flights, it's worth it to shop around. Most sites allow you to select your seats and to check-in online, before you go to the airport! Wear good clean socks & get a pedicure - you have to take off your shoes in airport security! Web Sites - Check out Kayak.com, Farechase.com, Expedia, Travelocity, Orbitz, Priceline and Cheap Tickets. These sites have great prices & help you quickly compare fares! Book Direct with Airlines - Lately, we have found that they have some of the best deals. Just go to their web sites & do some searches. In addition to your favourite airlines, be sure to also visit Air Canada, Alaska Airlines, West Jet and Tango. They have great fares! We highly recommend that you rent a car from Kelowna International Airport, mostly because of the convenience, savings and selection that comes with buying your groceries & beverages in Kelowna, on your way up to Big White! Canawest Limo-Coach Service Ltd.- Canawest offers a 20 passenger Executive Entertainer Day Coach for your group & is suitable for multiple families traveling together or many people in a large group. It is an incredible experience with large washroom, vanity, galley, reclining executive chairs, a lounge, dinettes, sofas and an entertainment area. You can charter this luxury fun bus to pick you up from the airport, wait while you get groceries & drop you off at your door at Big White BC! Big White Airport Shuttle - Scheduled hourly departures from the airport and Big White BC. The first and last airport departures are 8:00 am and 11:00 pm. The first and last Big White Airport departures from Big White are 3:30 am and 5:00 pm. Our BC ski resort experience has revealed that guests who take lessons generally have extraordinary ski vacation experiences, compared with those who do not. Taking lessons is worth it. We recommend that you take lessons at least 2/3 of the time that you are at Big White, or at any ski resort. Get lift line priority, quickly gain confidence, get to know the mountain really well, and ski/ride with people of your own ability. Big White BC has an excellent childcare program! Book early to avoid disappointment! Check www.insuremytrip.com - compare options and buy online. Cheaper mid-week lift tickets (black out dates apply) can also be purchased from Coopers Foods on Highway 33 on your right, shortly after exiting Highway 97. Please keep in mind that these discounted tickets are non-refundable. We recommend buying fewer tickets than you think you'll need as there is a pretty good chance that you are overestimating the number of days that you will ski/ride. This way, you can take an unexpected day off due to weather or fatigue, without a penalty. If you book Big White lodging through Central Reservations, you also get a 10% discount, however, your ticket savings will pale in comparison to your lodging savings when you book owner-direct Big White lodging. If you are coming to Big White BC for more than 16 days, then you should buy a season's pass! Take the Free Big White BC Guided Mountain Tours - You will get to know Big White Mountain really fast and learn all the local secrets! Tours depart daily opposite the Village Centre Mall at 9am and 1pm daily. Look for the snow hosts in the bright yellow jackets - you can't miss them! Take Big White Skiing/Riding Lessons - Quickly improve your ability and confidence to ski/ride more diverse terrain, get more skiing/riding time with lift line priority and ski/ride with people of your own ability. It is fun and there is nothing like the joy of personal sport improvement! Keep your Hands Warm - Get Gortex gloves with warm liners. Pre-treat your gloves with Nik-Wax for extra water-proofing. Big White Grocery Strategies - Ignore this Advice at your Peril! We highly recommend that you pick up the bulk of your groceries & beverages in Kelowna on your way to Big White. There is a convenience store in Big White, however, selection is limited and you are paying a premium! Here are some conveniently located Kelowna BC grocery stores, just a few minutes from your driving route between the Kelowna Airport and Big White BC. From the Airport, drive 2 lights past the Highway 33 turnoff. Safeway is on your left. From Vancouver & Washington, Safeway is on your right hand side of the road on Highway 97, 2 lights before the Highway 33 turnoff. Another option is IGA on highway 33 just 5 minutes after the highway 97 turnoff on your left. There is also a liquor and drug store in the same mall. Costco is a great place for meat, cheese, pre-prepared foods and just about anything you are going to need! It is located on the corner of Hwy 97 and 33. If you pick up groceries at IGA, there is a liquor store in the same mall, making IGA a convenient 1-stop shop for all supplies! If you organize for delivery ahead of time, please DO NOT give the door code to the delivery people. This compromises your safety and security while in the property. You are also responsible for all missing items in the property at the time of departure. Giving out the door code to strangers puts you and your personal property at risk. Deliveries are best made shortly after your arrival at the vacation property. VFS will take your online grocery order and deliver to Big White Ski Resort. IGA delivers groceries every day of the week to Big White. You must order by noon the day prior to when you want the delivery (eg. order by noon on Thursday for Friday delivery). Groceries are delivered to the resort around 10am - Noon. Delivery charges are $10 for all orders, with a minimum order of $100. Order nutritious, delicious, ready-to-cook meals to be delivered to your door. Make use of the kitchen/dining space in your property without worrying about spending hours pondering meal preparation on your vacation. Guests who sign up for our Big White Newsletter get a discount with Smart Start Meals. Free Welcome & Family Carnival Nights - Great fun for the whole family on Saturdays and Thursday nights. Enjoy fireworks, large outdoor bonfires, torch-light parade, free family games & kids activities, hot chocolate and more! Times: 6-8 pm in the Village. Free Crafts for Kids - Arts and crafts fun at the Kids Centre, every Monday from 4 - 5pm. Hot Chocolate around the Bonfire - Cozy up around the fire and enjoy free hot chocolate at the Happy Valley Day Lodge, daily from 5 - 6:30pm. Mega Snow Coaster - North America's biggest tubing park! Open 4 - 9 pm weekdays and 2 - 9pm weekends at the Happy Valley Gondola base. Outdoor Skating Rink - North America's largest and highest outdoor skating rink! Open daily from 9 am-10 pm at the Happy Valley Gondola Base. Skate rentals available! Skating parties are also held on Tuesdays from 6 - 8pm. Kids' supervision and skate rentals are provided for $10. Snowmobile Tours - Take 1, 2, or 4 hour tours. Ride single or double. Even the kids can join in on this activity and rent a Mini Z miniature snowmobile. Tours include safety gear & hot chocolate! Fireworks - World famous fireworks displays are held every Thursday and Saturday at 8pm. Watch from wherever you are on the mountain. Cross Country Skiing at Big White BC - The official Big White trails start the Happy Valley Gondola Base. There are 25 km of groomed trails. Rentals are also available from the rental shop in the Village. Cross Country Skiing in the McCulloch Lake Area - Recommended!One of the most incredible trail systems is located in the Mculloch Lake Area, about a 25 minute drive from Big White Ski Resort. With over 125km of groomed trails in pristine wilderness, these are some of the best trails in the area. Proceed back down Big White road to Route 33. Turn left. The trail head begins about 5 mins down the highway. Turn right on McCulloch Lake Road. The trails are about 10 seconds before you reach McCulloch Lake Resort. There is a warming cabin at the entrance. Dogsledding - Mush your way through Big White's beautiful back country! Sleighriding - Book for 1 - 1.5 hours for up to 16 people. Skiing/Riding Day at SilverStar - Take the Inter-Mountain Day Trip Shuttle to SilverStar for a full day of skiing/riding. It is well worth it. SilverStar is a great resort and a fantastic way to get more Okanagan powder! Call 250-491-6111 to book. Snowshoe Tours - Take a 1.5 - 2 hour guided tour, departing 9:30am, 1:30pm or 4:30pm. Tours include your gear, a guide and refreshments! To pre-book any of these activities please email the Big White Activities Desk or phone (250) 491-6111. Wine tours are an excellent idea for your day off! You can buy some incredible wines that are not available in the regular wine stores. Our favourite is Burrowing Owl! Big White is at a much higher elevation than most BC ski resorts and the pressure change is going to wreak havoc in your suitcase! Whether you are flying or driving to Big White BC, that last 45 minutes from Kelowna to Big White will cause your plastic bottles to explode & liquids/creams to leak out of their containers! Wrap and seal all bottles filled with liquids or creams in plastic ziploc bags! Big White BC check-in information - Remember that there is no front desk service, as you are renting owner direct Big White rentals. The owner will send you complete check-in & emergency contact information by e-mail upon final payment. If you do not receive this information immediately, please contact the owner to get it. If you cannot contact the owner, please contact us for assistance. Never leave home without check-in information & keep it in your carry on luggage! - Always remember to pack the check-in & arrival instructions with your carry-on bags, so that you are not locked out in the event that your luggage is lost! Warm boots with huge treads - It snows like crazy in Big White BC! It can also be cold, so keep your feet warm with proper footwear for apres activities and walking! High quality lip balm - Apply it several times daily to avoid chapped lips. Big White is extremely dry. High quality moisturizer - Big White is very dry. Helmets for kids - Big White runs out of them! Powder leashes - There is lots of powder and losing your skis would be a big drag! Treat your Gortex prior to Arrival - Follow the manufacturer's instructions for re-conditioning your Gortex gear!. We also recommend Nik Wax for Gortex gear and especially for gloves. Animal Hazards - Be wary of deer, moose and other wildlife, including cattle - especially on Big White Road. Whether you hit a deer, a moose or a cow, you and your car can get demolished at even slow speeds. Gas Up-in Kelowna. There is no gas station for 75 km after you leave Kelowna, including in Big White. Running out of gas is a reality if you do not leave Kelowna with a full tank! Leave Kelowna with a full tank! Wiper Fluid - Make sure that you are totally topped up, with a spare jug in the trunk! Weather changes rapidly on the high mountain roads and it can get messy! Bathroom Breaks - Before you leave the airport, or in Kelowna. Thanks for Visiting our Big White BC Lodging & British Columbia Vacation Planning Site!